Since this website was launched in 2012, Craig Morris has been its main blogger and the lead author of its annually updated e-book. Four updates and more than 400 blog posts later, he is moving on to work for the Renewables Grid Initiative. Today, he bids us farewell. Reason 1: In 2004, Germany adopted a target of 20% renewable electricity by 2020, a target numerous detractors doubted. 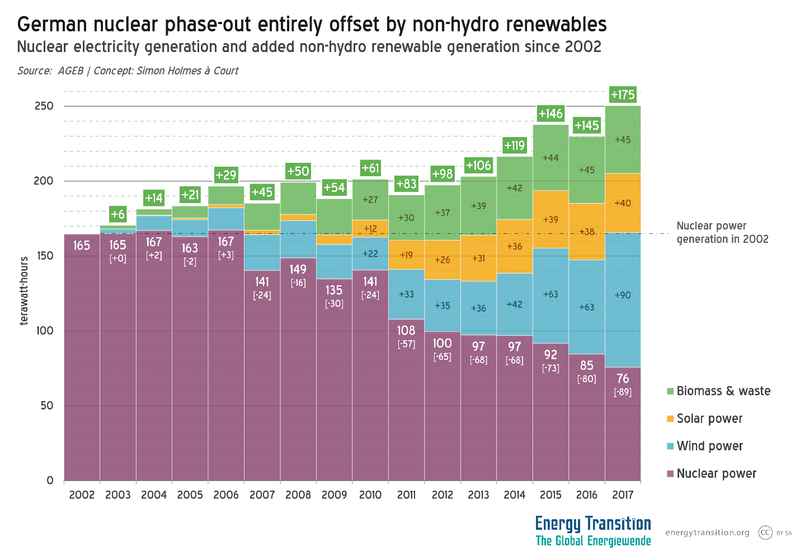 But the 2002 nuclear phase-out would have removed the roughly 30% share of nuclear power by that date as well – meaning that fossil electricity would have covered the missing 10%. Top politicians stated that new coal plants and gas turbines would need to be built, and the sector set out to do so. Those plants were built, but not needed. And the share of renewables, now already around the new target for 2020 of 35%, is to be increased to 65% by 2030. Reason 2: In 2011, when Chancellor Merkel closed eight of 17 nuclear reactors, detractors warned about power outages and reliance on power imports. Then, starting in 2012, Germany began preventing power outages in France with exports, becoming the greatest net exporter in Europe in 2017. And power reliability reached a record high. So when the naysayers tell you that some future obstacle is insurmountable, remember they have always said that about everything – and we have moved twice as fast as we ever imagined possible. As recently as 2014, I produced some 600 blog posts a year, most of them at the now-defunct Renewables International website. A year and a half after stepping away from that project, I am leaving blogging altogether. On April 1, I joined the Renewables Grid Initiative, where I will help produce a scenario for future grid needs in a largely renewable power supply. I will probably have withdrawal symptoms, but quitting blogging also feels like getting down from a bucking bronco in a rodeo. I had to cover a wide range of issues. I spent a few hours a day just reading in order to decide what topics were the most interesting. I’ll miss being able to publish my two bits regularly, but being able to focus on something with defined boundaries sounds like a relief. This project was specifically launched to fill a gap that arguably no longer exists. In the wake of Germany’s reaction to the nuclear accident in Fukushima, few international onlookers were steeped in German energy policy, and neither the German government nor civil society had any international communication efforts in place. The result was what I call drive-by journalism: some foreign journalists hadn’t bothered to look deeply enough into the subject and wrote some obviously superficial stuff (that hasn’t changed much, unfortunately). From 2002-2008, I had explained German energy policy to a German audience in German at the country’s biggest IT publisher. Some of those articles reached 200,000 readers and were circulated in German ministries and institutes. Since 2008, however, I have mainly written in English, my mother tongue. But with this decade of experience, I was well situated to explain what was happening in Germany in greater depth and against the historic backdrop. So in 2012, this project became the first platform that attempted to explain the Energiewende in English. There was no Energiewende direkt newsletter in English from the German Economics Ministry at the time, no Clean Energy Wire (CLEW). Agora Energiewende had just gone into business but was not yet producing material in English, and the Agorameter came a few years later. I think Energy-Charts.de by Fraunhofer ISE’s Bruno Burger came into existence around that time; it has evolved over the years, partly because of my repeated pesky emails to Bruno asking for this or that extra visualization. To my never-ending surprise, he often made the additions. Hey Bruno, thanks so much! You’re in good hands with those folks if you’re looking for overviews of German energy news and data in English. The German government also hosts an invitation-only top-level international energy transition conference. The German Foreign Office has an energy transition exhibition on the road. But if this website still fills a gap, and I think it does, it’s related to political analysis. If a newspaper like Handelsblatt does a hack job on the Energiewende, CLEW preserves its neutrality and merely sums up the article. No one else comments. I had the freedom here to point out omissions. And make the charts above. I won’t produce such analyses any longer. Part of me will miss them, but another part won’t – my rebuttals rarely reached the target audience of the article I was correcting, and my readers did not need to hear the same thing over and over. I would like to thank everyone at the Heinrich Böll Foundation for their support and the content leeway I was always provided, especially Rebecca Bertram (who remembers that the Energiewende is a green peace dividend) and Silvia Weko. In previous years, Alexander Franke and Arne Jungjohann were also very supportive in this project. Most of all, dear readers, I’d like to thank you. And if you’d like to stay in touch, I’ll still be there on Twitter. Hi Craig, well, this is the second blog you leave which I read daily. We will miss your good eyes, concise summaries and useful explanations. I wish you good luck in your new “mission”, and hopefully will hear/read about you in the future. Good work. The directions for grid development are becoming a central concern so I expect that you will find plenty to do. All the best in your new avatar! Remember that if you feel blogging withdrawal symptoms, you can still comment at other sites like GTM. Will this blog continue under new management? thanks for your great articles and your support for renewable energy. I was happy, too, to find you here after you’ve left Renewables International. Many news today have to be commented and explained to get their real meaning. Good luck and hopefully we can hear something from you in the future! Craig, you are off to a place that needs you even more than the blogging world of the energy transition. I can’t think of a better person to light a fire under the needed grid infrastructure. Rest assured that at FORESIGHT Climate & Energy we will continue to counteract “drive-by” journalism with the “stop-up and think” variety, though I will miss your graphs dreadfully. Wishing you a strong following wind and sunny days at the Renewables Grid Initiative. Hola desde Mèxico, soy un seguidor de tus artículos, te deseo mucho éxito en tus nuevos proyectos…. A big thanks from a quiet admirer, a Dutchman living in France. I probably read 80% of your posts and what they gave me most was insight and understanding. Everything that is new and different is hard to explain to people anchored in the old, as we all are in a sense, so not having just the facts but understanding them is of great value. Here in France much of the Energiewende has yet to start and the misunderstandings in public and administrations are huge. Much can be learned from your body of work. I hope you keep this archive online. Good luck in your new adventure! I now spend almost as much time as you do but with nowhere near the audience commenting on the ridiculously slow Australian Energy Transition. I have to say one of my first sources of hard analysis was Renewables International and it provided not only facts but inspiration. While our coal owned government fights tooth and nail against renewables, the facts are getting out there and due to our amazing wind and solar resources, the snowball is finally gathering pace. With the continuing explosion of rooftop solar and large scale wind and solar committed over the last 18 months wind and solar will jump from about 6% of generation in 2016 to close to 20% by 2020, still bad but certainly a rapid improvement. Thanks for those hundreds of blog posts. We’ll miss your contribution to all of the topics that have been featured here. Good luck with your new job! Wish you success with your new task, but will miss your sharp analysis dearly. I am convinced the gap you described above still exists. 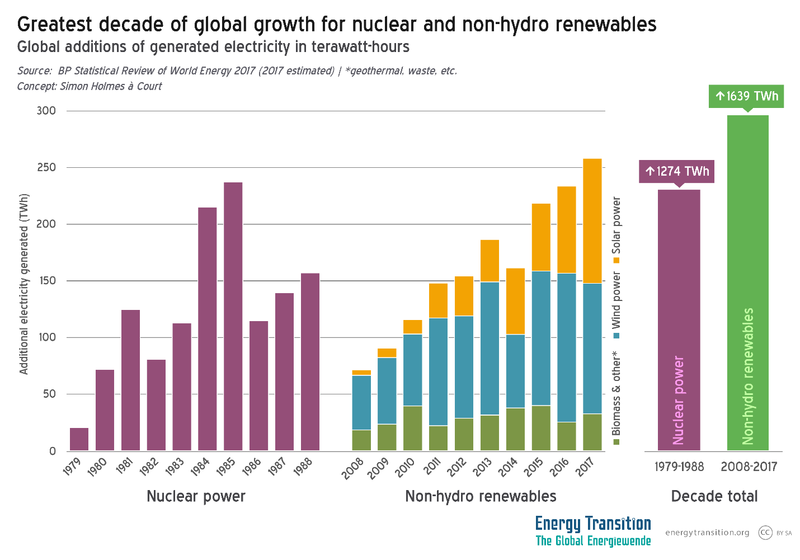 Looking for in-depth explanation of raw data concerning the energy transition your blog was my first source. All the above mentioned pages can’t replace this. Hope, this page will remain online — and perhaps we’ll see a blog at times. Your new work could be a new source of inspiration for that. Your track record is certainly impressive, Craig. Even in the Netherlands, where I live, almost everybody I meet who fundamentally misunderstand the status and prospects of the German Energiewende, and who deeply confuse the relative costs and benefits of renewable versus nuclear energy, reports having read one or (many) more of your articles on these subjects. Your reach goes far beyond Germany! Previous PostWill 2018 be the year of new nuclear design success?